Offering you a complete choice of products which include prefabricated bungalow and log house. We are a trusted organization of this domain in offering a wide gamut of Prefabricated Bungalow to our valued customers. Our offered houses are made of premium quality materials and modern technology. In addition to this, these products that we offer have supremacy chrome varnish to ensure corrosion resistance and long service life. • Structure Construction: The structural framework shall be the all welded type to comprise of the bottom frame, overall framework, internal external cladding with insulation other peripherals, sloping self-draining roof. It would be an all-welded construction, in which the main corner vertical support posts shall be made from M.S. square pipe structural with lifting arrangement. • External cladding: Shall be 18 gauges. M.S. pressed steel vertical corrugated / M.S. sheets which shall be ARC welded to the bottom MS channel frame, corner posts, top frame roof frame... All gaps are sealed at edges at seams, bottom sills etc. • Inner panel work: Pre-laminated 9 mm particle Board will be screwed on the side wall on the internal supporting structural members. All corners and the vertical joints of the panels will be neatly finished with Aluminum powder coated angles flats or biddings PVC biddings. The false ceiling will be pre-laminated boards with similar biddings. All the internal partitions would be of 40/50 mm thickness with similar in-fill material as below. • Insulation 50 mm thick: Glass wool walls and Expanded Polystyrene slabs having excellent thermal efficiency and acoustic performance of 50mm average thickness confirming to IS 8183; which will be rot proof, fire retardant, non-hygroscopic and vermin proof. We are a trusted organization of this domain in offering a wide gamut of Log House/Wooden House to our valued customers. 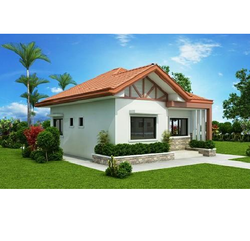 Our offered houses are made of premium wooden quality materials and modern technology. In addition to this, these products that we offer have supremacy chrome varnish to ensure corrosion resistance and long service life.